The StrEAT Food Festival in Manayunk is a popular event. Food trucks will line Main Street serving everything from tacos to ice cream. Hope you're ready for a busy weekend because there's a lot going on in Philly. There are two beer festivals, the popular StrEAT Food Festival in Manayunk and a film festival with must-watch movies from Sundance and SXSW. But that's not all: you'll finally be able to visit the Marvel exhibit at the Franklin Institute, an Instagram-worthy gin bar is opening its doors and a popular burger chain is serving a "Game of Thrones" menu. Check out all the biggest events happening this weekend below. "Marvel: Universe of Super Heroes" will open Saturday. On view in the exhibit will be 300 original artifacts, including some of Marvel's most iconic costumes, props and original art (get a first look at the exhibit here). Fans of Black Panther, Spider-Man, Captain America and the many other characters in the Marvel Universe won't want to miss out on seeing this special collection. Take the moss-covered elevator up to the fourth floor of Philadelphia Distilling to The Betsy, open Thursday through Sunday. There will be greenery throughout, put together by a floral and garden design team, and a range of Bluecoat Elderflower Gin cocktails. Make plans to go out for lunch on Friday and enjoy a fancy grilled cheese. Try a sandwich stuffed with fries, American cheese and cheese whiz, or bite into one with Raclette cheese and mortadella. "Game of Thrones" Season 8 returns on Sunday night. Celebrate by ordering a meal of ice and fire off Shake Shack's not-so-secret menu. There's an icy shake and a fiery burger. Head to Center City's Philadelphia Film Center this weekend to see a movie from Sundance or SXSW. Among the mix of films is a political thriller starring Keira Knightley and a family drama featuring a powerful performance by "Crazy Rich Asians" breakout star Awkwafina. Bryn Mawr Film Institute will screen Steven Spielberg's "Jurassic Park" on Saturday. After, "Dino" Don Lessem, who served as dinosaur advisor during the film's production, will separate fact from fiction. Twenty-five breweries from Pennsylvania, New Jersey and Delaware will pour brews on Saturday at this beer fest. Each brewery will serve its flagship beer, that's the one its best known for, as well as a speciality brew that could be something new or rare. A sake garden, presented by Parks on Tap, will return to Shofuso Japanese House and Garden in West Fairmount Park this weekend as part of the 2019 Subaru Cherry Blossom Festival. 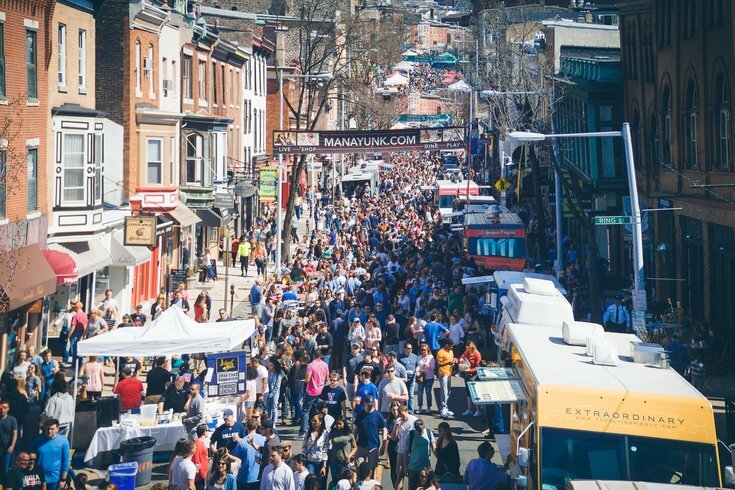 Sunday, more than 50 food trucks will park on Main Street in Manayunk for the StrEAT Food Festival. There will be tacos, cheese curds, ice cream, barbecue, crepes and so many other delicious things to eat. The festival celebrating cask ale – that's unfiltered, unpasteurized beer – is back on Sunday afternoon. From noon to 4 p.m., cheers beers at Yards new location on Spring Garden Street.